Unimog, Amsoil, better, improving, fuel, economy, injectors, injecters, cleaner, cleaning, Stump, the, hummer, humvee, diary, windows, wallpaper, gear, lubes, links. Amsoil Independent Direct Jobber, Ed Sanders - Click here to check it out! edsanders.com... My first web site. How to solve the gas valve problem once and for all. 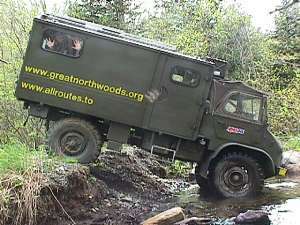 More Pics of Ed's Unimog at Stump the Hummer Taken by Chip Greives here. High resolution pictures of Unimog and trailer with signs suitable for use as Windows wallpaper available by clicking here. Be sure to check out the Amsoil Section for info on gear lubes and other stuff that will make your Mog or Pinz perform better and use less gas! Proven since 1972 - the FIRST in synthetics in the USA. Hell Gate on the Dead Diamond River. Click here to learn about the best lubricants to help keep your Unimog trouble free! E-Mail: webmaster@allroutes.to Copyright 1999, 2000, 2001, 2002, 2003, 2004 by Ed Sanders. Unimog, Amsoil, better, improving, fuel, economy, injectors, injecters, cleaner, cleaning, Stump, the, hummer, humvee, diary, windows, wallpaper, gear, lubes, links. Unimog, Amsoil, better, improving, fuel, economy, injectors, injecters, cleaner, cleaning, Stump, the, hummer, humvee, diary, windows, wallpaper, gear, lubes, links. Unimog, Amsoil, better, improving, fuel, economy, injectors, injecters, cleaner, cleaning, Stump, the, hummer, humvee, diary, windows, wallpaper, gear, lubes, links. Unimog, Amsoil, better, improving, fuel, economy, injectors, injecters, cleaner, cleaning, Stump, the, hummer, humvee, diary, windows, wallpaper, gear, lubes, links. Unimog, Amsoil, better, improving, fuel, economy, injectors, injecters, cleaner, cleaning, Stump, the, hummer, humvee, diary, windows, wallpaper, gear, lubes, links. Unimog, Amsoil, better, improving, fuel, economy, injectors, injecters, cleaner, cleaning, Stump, the, hummer, humvee, diary, windows, wallpaper, gear, lubes, links. Unimog, Amsoil, better, improving, fuel, economy, injectors, injecters, cleaner, cleaning, Stump, the, hummer, humvee, diary, windows, wallpaper, gear, lubes, links. Unimog, Amsoil, better, improving, fuel, economy, injectors, injecters, cleaner, cleaning, Stump, the, hummer, humvee, diary, windows, wallpaper, gear, lubes, links. Unimog, Amsoil, better, improving, fuel, economy, injectors, injecters, cleaner, cleaning, Stump, the, hummer, humvee, diary, windows, wallpaper, gear, lubes, links. Unimog, Amsoil, better, improving, fuel, economy, injectors, injecters, cleaner, cleaning, Stump, the, hummer, humvee, diary, windows, wallpaper, gear, lubes, links. Unimog, Amsoil, better, improving, fuel, economy, injectors, injecters, cleaner, cleaning, Stump, the, hummer, humvee, diary, windows, wallpaper, gear, lubes, links. Unimog, Amsoil, better, improving, fuel, economy, injectors, injecters, cleaner, cleaning, Stump, the, hummer, humvee, diary, windows, wallpaper, gear, lubes, links. Unimog, Amsoil, better, improving, fuel, economy, injectors, injecters, cleaner, cleaning, Stump, the, hummer, humvee, diary, windows, wallpaper, gear, lubes, links. Unimog, Amsoil, better, improving, fuel, economy, injectors, injecters, cleaner, cleaning, Stump, the, hummer, humvee, diary, windows, wallpaper, gear, lubes, links. Unimog, Amsoil, better, improving, fuel, economy, injectors, injecters, cleaner, cleaning, Stump, the, hummer, humvee, diary, windows, wallpaper, gear, lubes, links. Unimog, Amsoil, better, improving, fuel, economy, injectors, injecters, cleaner, cleaning, Stump, the, hummer, humvee, diary, windows, wallpaper, gear, lubes, links. Unimog, Amsoil, better, improving, fuel, economy, injectors, injecters, cleaner, cleaning, Stump, the, hummer, humvee, diary, windows, wallpaper, gear, lubes, links. Unimog, Amsoil, better, improving, fuel, economy, injectors, injecters, cleaner, cleaning, Stump, the, hummer, humvee, diary, windows, wallpaper, gear, lubes, links. Unimog, Amsoil, better, improving, fuel, economy, injectors, injecters, cleaner, cleaning, Stump, the, hummer, humvee, diary, windows, wallpaper, gear, lubes, links. Unimog, Amsoil, better, improving, fuel, economy, injectors, injecters, cleaner, cleaning, Stump, the, hummer, humvee, diary, windows, wallpaper, gear, lubes, links. Unimog, Amsoil, better, improving, fuel, economy, injectors, injecters, cleaner, cleaning, Stump, the, hummer, humvee, diary, windows, wallpaper, gear, lubes, links. Unimog, Amsoil, better, improving, fuel, economy, injectors, injecters, cleaner, cleaning, Stump, the, hummer, humvee, diary, windows, wallpaper, gear, lubes, links. Unimog, Amsoil, better, improving, fuel, economy, injectors, injecters, cleaner, cleaning, Stump, the, hummer, humvee, diary, windows, wallpaper, gear, lubes, links.